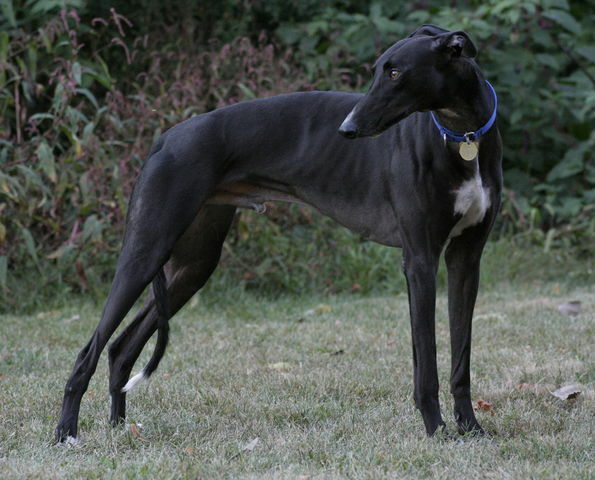 In 1990 I saw a documentary on PBS about the treatment of Greyhounds in the U.S.A. After seeing that documentary, I resolved to adopt a greyhound once I was in a position to do so. That opportunity came in 2007 when I adopted a three-year old racer named Thunder. Thunder began his racing career in Birmingham, Alabama in November 2005 and ran his last race on August 23, 2006. In all he ran a total of 58 races, placing 1st in seven. Repetitive poor showing and a broken hind leg were responsible for his early retirement. Greyhound racing as we know it today began in 1919. While it might appear as a harmless sport, greyhound racing subject these racers to an extremely difficult life. They spend long hours in cramped, dark kennels, are deprived of normal social contact, rarely see or interact with their owners, are overworked, and are subject to frequent injuries (often fatal) during races. Every year thousands of young, healthy greyhounds are killed because of injuries, because they lack racing potential, or because they are no longer competitive. Greyhounds make wonderful pets. They are loving very low-key and easy-going, are highly trainable, rarely bark, are pretty much low-maintenance, and are not aggressive. They are the consummate couch-potatoes. A half hour walk in the morning and a half hour walk in the evening (always on a leash) is all they need as far as daily exercise is concerned. If you are considering a adopting pet, a greyhound should certainly be at the top of your list. My Lady turned me on to Greyhounds! We have 2 and both are one of the best thing I have ever done! Hap, thanks for taking the time to respond. Indeed, having a greyhound as a pet is an experience like none other. Been adopting since '92. We've had eight total, currently have four. You couldn't ask for a better companion. Eight! Wow! I can imagine how wonderful it is having the four you currently have. You are certainly blessed! Thanks for sharing. I adopted mine last year, and he's wonderful! We live in a small urban flat, and he's happy to snooze away the day while I'm at work, and then cuddle while I read after our evening walk. We've had greyhounds since 96, they're gorgeous animals, real characters, good with kids, cats, even chickens (after a brief period of training - they learn fast!). Ric, get your information straight before you publish it. They are NOT kept in dark, small crates all the time. They DO interact with the trainers and owners all the time. If they were kept in crates all day and night they would not be able to race at all. They would suffer from arthritis and soreness. And they do not suffer from either. They are in large turn out pens most of the day for exercise and play time. Learn the TRUE facts before inserting foot in mouth. The fact of the matter is that racing Greyhounds do not live a 'normal' life. They are affectionate loving dogs and should be in a home environment with love and comfort. NO animal should be used as a money machine. Greyhounds are the most divine dogs God created and the most abused! Dear anonymous, I have over they years sought to get my information straight. In fact, for quite a while I did give the Greyhound Racing Industry the benefit of the doubt. I was not always anti-greyhound racing. However, my findings from research that I have conducted in the other direction have led me to conclude that greyhound racing is deleterious to the overall health of a greyhound. Seriously Ric, a little research might be in order. Racing greyhounds have more human interaction than most pets. There are people working in and around the kennel all day long. They're out of their large crates several times a day for regular turn outs. They're groomed and walked regularly, and they are fed a healthy diet. Injuries? Yes, they do happen. But the chance of a serious injury is less than .05% (one half of one percent). Good thing they don't classify financially motivated euthanasia a "serious injury". Robert, thanks for your response. As I indicated in my reply to another respondent above, I have done a little research. And as I indicated, I gave the racing industry the benefit of the doubt. However, my further research have pushed me in the direction of rejecting the sport altogether. And it would appear that some of the positive things you have indicated (as these occur in some places) are the exception rather than the rule. I do appreciate your response. Thanks again. You call yourself a writer, Ric? Why don't you do some research on your subject instead of trying to sell a book based on lies, rumors, and Grey2K propaganda? Ric, I mistakenly thought you were promoting a book. I still feel you are wrong about how greyhounds are treated. No hard feelings, Craig :-) I respect you viewpoint on the debate. I have been on your side of the argument, so I feel that I have some objectivity, but as I said, I do respect your viewpoint. Thanks for taking the time to respond. If greyhounds have such a greytlol) life at the track then why do so many that are rescued after 'retirement' have some form of PTSD? Ask a rescue owner/worker how many dogs come through their facility that need extra TLC to adapt to life on the couch. We have a rescue that ran in 108 races and another who never made it to the track. Guess who is laid back and calm and who is afraid of loud metallic noises and which one cowers when I make a sudden movement like she's been beaten? If greyhounds weren't such a mellow adaptable breed none would ever make it to retirement. They may see people through the bars of their cages and get turned out four times a day but the track is not a home. Thanks for posting this Ric. Thunder is a beautiful dog. My wife and I have adopted three ex racing greyhounds over the years, two of them black beauties like yours. One of our girls is 14 and still going strong. They are unique, gentle companions and it saddens me that greyhound racing is still permitted in some states of the US. The good news is that dog racing fans are slowly dying out, and the industry with them. Good riddance. Thanks for your response and your compliment for Thunder. It is the case indeed that more and more tracks are closing down. What is interesting is that in some states where it is still legal, the tracks are non-operative. This is certainly a good sign and bodes well for the future of those wonderful animals. I hope you'll keep writing about Thunder, Ric. I imagine you have some stories (they can be real goofballs sometimes). We have three right now. I've been in greyhound rescue since I adopted my first one back in the mid nineties and I've been hearing the same tired arguments from the pro racing crowd since then as well. I appreciate you being polite to the pro racing commenters. I gave up on that long ago. Thanks, Ironicus. Goofball!!!! Thunder is the consumate goofball. I am sure other greyhound parents will jostle to make the same claim of their lovely little goofs. Indeed stories abound. I adopted my first grey in 2004. Sadly, he passed away last July from lung cancer. A big (88 pounds) loving, goofy guy. Best friend, constant companion..."my boy"...my heart still aches. It took years for him to overcome severe anxiety issues. I am now the proud parent of a sweet little 18 month old track reject. She was scared of her own shadow, but is loving and sweet and slowly coming out of her shell. What happens at the breeders kennels and the track - I don't know. I only know what I have experienced and it has been a lot different than what I've experienced with other dogs. I have horses as well, and I find the experience much closer to what I have witnessed with horses that have not been treated properly in their past. Lack of attention or abuse?? I have had people tell me some of each. I do not know the true answer, but I do know these are the most exceptional dogs on earth - so full of love and devotion; you couldn't ask for more from a best friend!!! Sorry to hear about your loving 88-pounder. And I agree that they "are the most exceptional dogs on earth." Thanks for sharing.